Cool twist on the classic concept for Starfinder! This installment of the Star Log.EM-series clocks in at 6 pages,1 page front cover, 1 page editorial, 1.5 pages of SRD, leaving us with 2.5 pages of content, so let’s take a look! We begin with a nice little introduction and the contextualization of the archetype herein within the Xa-Osoro system, before taking a look at the archetype. The Eldritch Trickster may only be added to characters with classes that gain spells or spell-like abilities from the 1st level feat or the race. The eldritch trickster as presented herein replaces the 2nd, 6th and 12th level class features. At 2nd level, we get psychokinetic trickster, which nets at-will psychokinetic hand as a SP, and if you already know it, you may lose it in favor of another spell of the same level. The rules language also takes the SP-angle into account. Additionally, the ability allows for the lifting of up to 20 lbs. or 2 bulk, +10 lbs. OR +1 bulk per every 2 levels beyond 2nd. Starting at 6th level, you may use Engineering or Mysticism’s disable device use and all skill tasks of Sleight of Hand at the range of psychokinetic hand. At 4th and 9th level, you may optionally choose to get expanded arcana, i.e. a Minor Psychic Power feat or one based on it. If you have a spellcasting class, you may instead choose a feat using spellcasting as prerequisite. Additionally, if you ever choose Major Psychic Power, you may substitute augury or status with a new spell, burglar’s insight. This spell is a 2nd level divination for mystic and technomancer, and, should you be using the Starfarer’s Companion, also for the legacy bard and wizard. The spell nets a scaling insight bonus to Bluff, Sleight of Hand and Stealth. If you have a class feature that grants an equal or greater bonus, you may instead spend 1 Resolve to roll twice, using the higher result. Unique: The spell runs out after using it key ability score modifier times. Nice catch: caster level increases do not increase the potency of this spell. The 8th level ability would be invisible thief, which lets you spend 1 Resolve as a standard action to use either disguise self or invisibility as a SP, with a duration equal to character levels. 12th level improves action economy to alternatively allowing for swift action activation. Also at 12th level, you can spend 1 Resolve Point as a reaction when provoking an attack of opportunity, preventing the provoking of the AoO. The pdf also features a new operative specialization, the spell scoundrel, which features Bluff and Mysticism as associated skills. You can make a Mysticism check with a +4 bonus to make a trick attack by using essentially a variant of token spell for your advantage. The exploit would be the flight hack, and whenever the spell scoundrel moves 10 ft. or more, you may designate up to Dexterity modifier squares. When moving from these squares, the movement doesn’t provoke AoOs. This is properly codified as a teleportation effect. Editing and formatting are good on a formal and rules-language level. The missed italicization and lack of replenishment clause slightly hurt an otherwise fun offering. Layout adheres toa 2-column full-color standard and the pdf has a nice artwork and no bookmarks, but needs no bookmarks at this length. 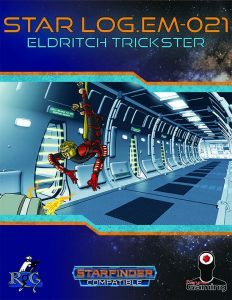 Alexander Augunas’ Eldritch Trickster is a surprisingly fun take on the eminent concept – I enjoy how it brings the concept to the game, and how it spreads its abilities. All in all, I consider this to be a fun, worthwhile offering. My final verdict will clock in at 4 stars – well worth checking out! You can get this nice Star Log here on OBS!